Coaches & Parents Information | Webster Lacrosse Club, Inc.
Players, coaches, spectators and parents are to conduct themselves in a manner that "Honors the Game"
maintain a positive image and make its full contribution to youth sports in Webster and greater Rochester area. taught and developed both at home and on the field during practices and games. concepts of fair play, or the skills of the game. It should be remembered that criticism, once made, can never be retracted. strive to be positive role models in dealing with young people, as well as with adults. courtesy and fairness to all parties while exercising their authority on the field. harass, or threaten an official. Observe the 24-hour rule before appoaching a coach or league director. have been established to encourage and maximize participation, as well as promote safety. 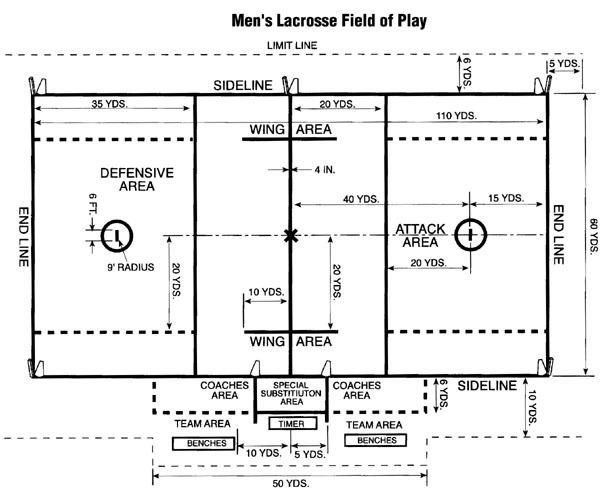 The three attackmen generally limit their play to the offensive end of the field working with the midfielders to score goals. They will maneuver in front of and behind the goal to set up and take shots. The midfielders cover the entire field playing both offense and defense. They must have speed and stamina in order to make the transition from one end to the other quickly. The defensemen generally play only in the defensive end of the field and are primarily responsible for defending the goal. They are also crucial in clearing the ball to the offensive end of the field with the midfielders. Defensemen may use a longer shaft on their sticks to assist in intercepting passes and to give them an advantage in scooping ground balls. The goalie defends the goal and prevents the opposing team from scoring. A good goalie directs his teammates in defense because he can see the field with the play unfolding in front of him.